The World Environment Day falls on the 5th of June. However being a Sunday and Nagaland with its predominantly Christian population, the day was observed all over Nagaland on Saturday June 4th 2016. A glimpse into the activities across the state to mark this day. Minister for Forest and Environment, Dr. Nicky Kire, parliamentary Secretary for YE&S, Khriehu Liezietsu, MLA Vikho-o Yhoshu, DC Kohima Rovilator Mor and others posed for a group photo during the cleanliness and tree plantation drive commemorating the World Environment Day at New Secretariat, Kohima. Chakhroma Student’s Union celebrates World Environment Day by planting trees at the new Deputy Commissioner’s Complex, Chumukedima. The Dimapur District Legal Services Authority (DDLSA) in collaboration with Life NGO and Dimapur Government College observed World Environment Day on 04.06.2016 by organizing an awareness program and mass social work with the students of Dimapur Government College. Commemorating the World Environment Day, the staff and officials of District Rural Development Agency, Dimapur led by Project Director, Alemla Chishi conducted social work in the office premises this morning. Nagaland University Non-Teaching Staff Association (NUTAK) Kohima Campus led by Nagaland University Pro-Vice Chancellor Prof. Pardeshi Lal observed World Environment Day by carrying out plantation drive. To celebrate the Green Sunday on 5th of June, FINGERPRINT-Design & Events in Collaboration with Eco club of S.M College and Immanuel College celebrated World Environment Day at their respective college with resource person as Mr. Obed Swu ACF, NZP Rangapahar. On the day, Animal Adoption Certificate was presented to SM College by the Resource person. Till date 41 animal has been adopted and a fund of 5,35,000/- has been collected through the Animal Adoption Campaign initiated by fingerprint and castle group in collaboration with dept of Environment, forest and climate change. Volunteers of Dimapur Chamber of Commerce & Industry, Business Association of Nagas and Dimapur Municipal Council pose for lens after conducting social work at New Market, Dimapur in commemoration of World Environment Day on Saturday June 4, 2016. Bethel Baptist School in partnership with Nagaland Pollution Control Board, NEPED and Department of Forestry observed ‘World Environment Day’ on 4th June 2016 under the theme “Go wild for Life”. Baptist Mission School Jotsoma observed World Environment Day with the rest of the world taking a theme ‘One child one plant’. The students along with the teachers had a cleanliness drive in the school premises and planted saplings what they brought from home. Most of the students contributed more than two saplings each and made the day successful and meaningful to the theme. On the morning of June 4th 2016, the people of Kiphire started the day with a well coordinated cleanliness drive in all the 11 wards of the town. Led by Shri. Sedevekho Khro, DC, Kiphire, the enthusiastic participation saw people from all walks of life- school students, Eco-Clubs, Church, elders and officials from various departments, getting involved in the joint effort. 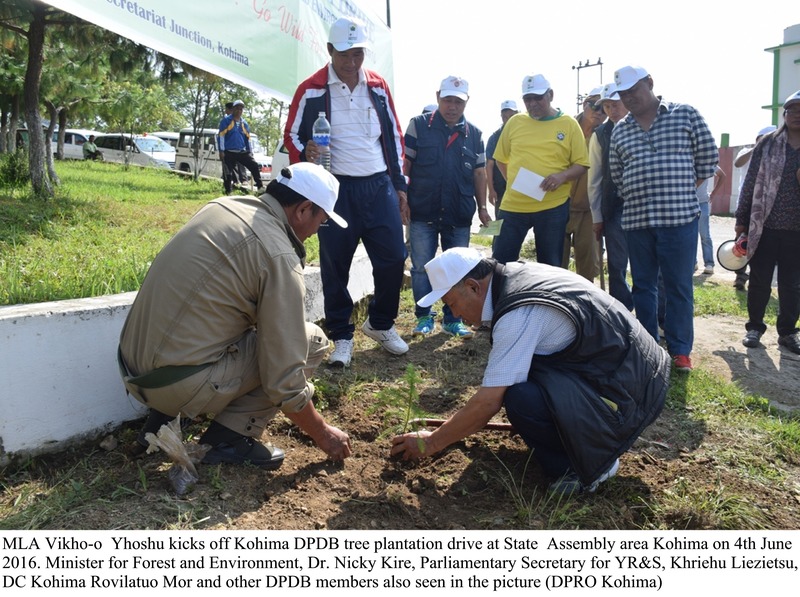 The Zapami Village Council (ZVC) under the Pfütsero sub-division, Phek district, observed World Environment Day 2016 by organising a community tree plantation at ‘Pfüchi’ under Zapami village located in the inter-state boundary between Manipur and Nagaland. Apart from faith and devoting oneself to God, the Ungma Baptist Church (UBA) Youth ministry has been imparting the values of creation (Mother Nature) as part of the ministry. More than 1500 strong members of UBA Youth ministry has been embarking on a mission by observing “Environment Week,” from 1-5 June to protect God creation and to spread awareness on environmental issues. The Youth Ministry of UBA has organized numbers of activities on the theme “Creative God.” A Graffiti day was held on day three June 03 and members painted art related to environment on the walls to let people know more about environment. The Wildlife Division, Dimapur observed World Environment Day on 4th June, 2016 at Forest Protection Camp, Intanki National Park, themed “Zero Tolerance for the Illegal Wildlife Trade” with the Chief Wildlife Warden, Nagaland, the Wildlife Warden, Dimapur, Deputy Conservator of Forest, Intanki National Park Staff , along with the neighbouring villagers. Minister for Forest, Environment & Climate Change, Dr. Neikiesalie Nicky Kire speaking at an event marking the World Environment Day (WED) at the state Botanical Garden in Kohima, referred to this year’s WED slogan ‘Go wild for Life’ and made a clarion call to everyone to spread awareness about the extensive consequences of wildlife crime and the damage it does to the environment. Kohima District Legal Services Authority commemorates World Environment Day with the Children of Chakhesang Christian Revival Church, Upper PWD Kohima and conducted awareness seminar on environment. It covered various laws like the Environment (Protection) Act, 1986, Forest Conservation Act, 1980, Water (Prevention And Control Of Pollution), 1974, Wild Life (Protection) Amendment Act, 2002, Wildlife Protection Act Of 1972, Noise Pollution Act, Hazardous Waste Handling And Management Act, 1989 etc.